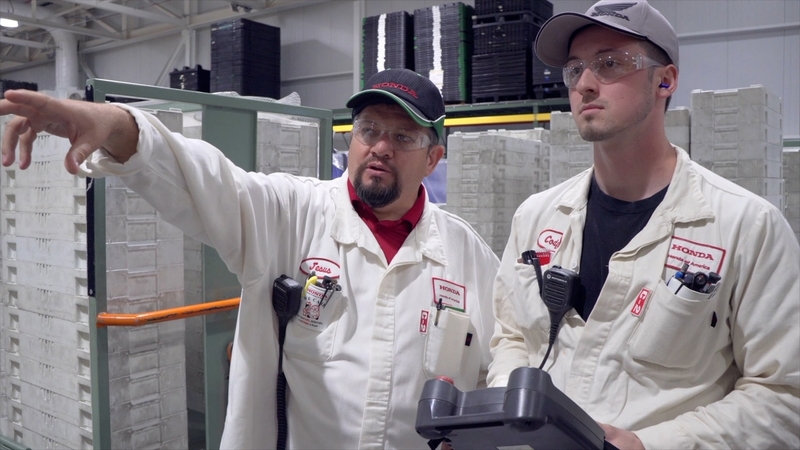 Jesus Dueñas, an avid environmentalist and an equipment services team leader at the Honda Anna Engine Plant in Ohio, is the latest subject of the What Makes a Honda is Who Makes a Honda video series. Dueñas and several friends started an organization known as Amigos de la Montaña (Friends of the Mountain) to plant trees on a mountain in his hometown of Patamban, Michoacán, Mexico. Areas of the mountain had been deforested over time and Dueñas decided to take action. Since 2010, he has traveled to Mexico yearly to plant trees and each year Amigos de la Montaña has grown both in the number of volunteers and trees planted. This year, 600 volunteers planted more than 15,000 trees. "Many people think that your actions have no impact. I'm a true believer that little by little, one person can make a difference,” said Dueñas, who has worked for Honda of America Mfg., Inc. for five years. The Who Makes a Honda video series focuses on Honda associates who live out the company's commitment to The Power of Dreams, a global theme that encourages Honda associates to conceive ideas that will create new value for customers and society and then show the determination required to bring those dreams to life. In addition, the video series spotlights the inspiring efforts of Honda associates in their work and in the community. The Who Makes a Honda video featuring Duenas is accessible at Honda's YouTube channel at https://youtu.be/GXuC-9wWReo. Based on its longstanding commitment to "build products close to the customer," Honda operates 19 major manufacturing facilities in North America producing a wide range of Honda and Acura automobiles, automobile engines and transmissions, Honda all-terrain vehicles, power equipment products, such as lawn mowers, mini-tillers and general purpose engines, and the HondaJet advanced light jet. Nine Honda auto plants in the region, including five in the U.S., have the capacity to produce 1.92 million automobiles each year. In 2016, more than 96 percent of the Honda and Acura automobiles sold in the U.S. were produced in North America. Those plants today manufacture 17 different models, including nine passenger cars and eight light trucks using domestic and globally sourced parts. Honda also operates 16 major research and development centers in the U.S. with the capacity to fully design, develop and engineer many of the products Honda produces in North America.